In our series of A Day in the Life profiles, we ask studio owners and instructors to share their day-to-day experience to give readers around the world a peek into what it’s really like managing or teaching at a studio. 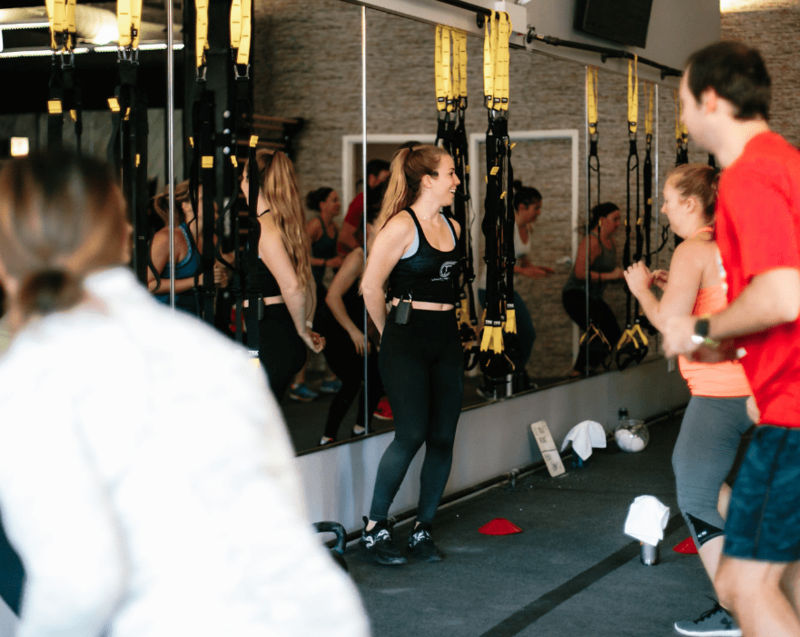 This month, we chatted with Amy Potter, Area Director of CrossTown Fitness, which has three studio locations in Chicago. Amy began her fitness career during undergrad as a personal trainer and group fitness instructor. She graduated from DePaul University with a B.S. in Health Sciences and is an ACE certified Personal Trainer and Strong First Gyra. 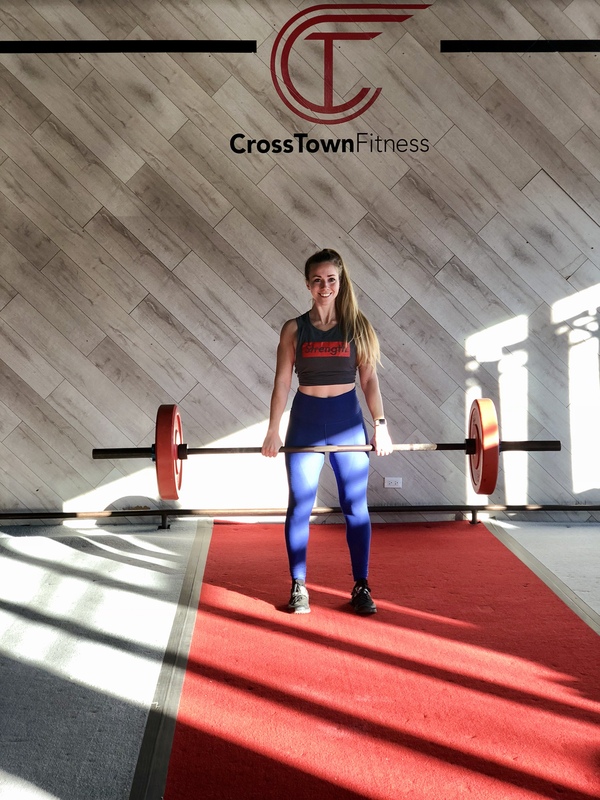 After graduation, she started working at CrossTown Fitness in Chicago as a Manager and Personal Trainer, and soon worked her way up to be the Area Director, as well as Personal Trainer and Group Trainer. She focuses on functional conditioning, power lifting, and high intensity interval training to give her clients results they can be proud of. From beginners to seasoned athletes, she loves challenging her clients to realize their potential to become healthier, stronger and more powerful than they thought possible. Read on to get a glimpse into her busy day as an instructor, personal trainer, and area director! I get up four days a week at 4:10 am and leave the house at 4:20 am. This gives me just enough time to get dressed, ready and grab overnight oats from my fridge. With such an early start to my day, I choose sleep over a long morning routine. I arrive to the studio around 4:30 and begin setting up for my class. I teach a high intensity interval training class called Total Body. Each trainer creates their own format for each class, but it always includes a mixture of both strength and conditioning. In class you can expect to see a variety of equipment, like kettlebells, dumbbells, boxes, battle ropes, slam balls and Rowers. I always listen to music while setting up to help wake me up and pump up my energy for class—my favorites are Bruno Mars, Kendrick Lamar and 2Pac. I teach the 5 am, 6 am and 7am Total Body class at our Northside location, in Wrigleyville, this morning. Whole Foods (right next door) opens! They have the best coffee. Once I get back, I take time to eat my overnight oats and drink coffee, while I go over operational tasks with the Director of Operations of the Northside studio, Kathryn. As the Area Director, I oversee management and operations at all three studios – Northside, West Loop and Roscoe Village. A big part of that is spending time with each Director at their location. We just launched a new CrossTown Fitness app so today we’re working on finding solutions to an appointment display issue we’ve been having. I have a personal training client at our Roscoe Village location at 10 am, so I usually head over there around 9:30. When there is no class going on, we get to use the entire space which is always really fun. Today we’re focusing on lower body strength, so we use the barbells for heavy deadlifts and back squats and then I like to incorporate movements that incorporate a lot of space, like broad jumps, bear crawls and medicine ball tosses. After my PT client, I usually stick around to catch up on emails and check in with the manager at Roscoe Village. Lunch date! My boyfriend and I don’t get to spend too much time together during the week since we are on different time schedules, so once per week I like to meet him at a restaurant across from his work. They have the best hummus plate. It comes with carrots, cauliflower, broccoli, radishes and guacamole! I don’t track calories or count macros. I find it too tedious, but I love this app called Daily Dozen. 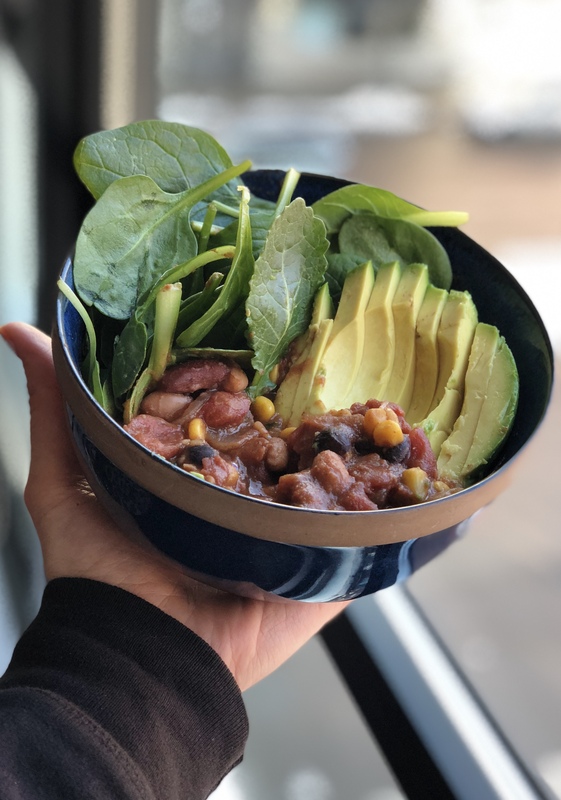 It makes eating healthy super easy because instead of measuring, or counting exact amounts, you just check a box for each serving for foods like greens, cruciferous vegetables, fruit and nuts. From noon to 3:30 is my time off, so I try and treat this time similar to the way that people who work a 9-5 treat their time off at the end of the day. 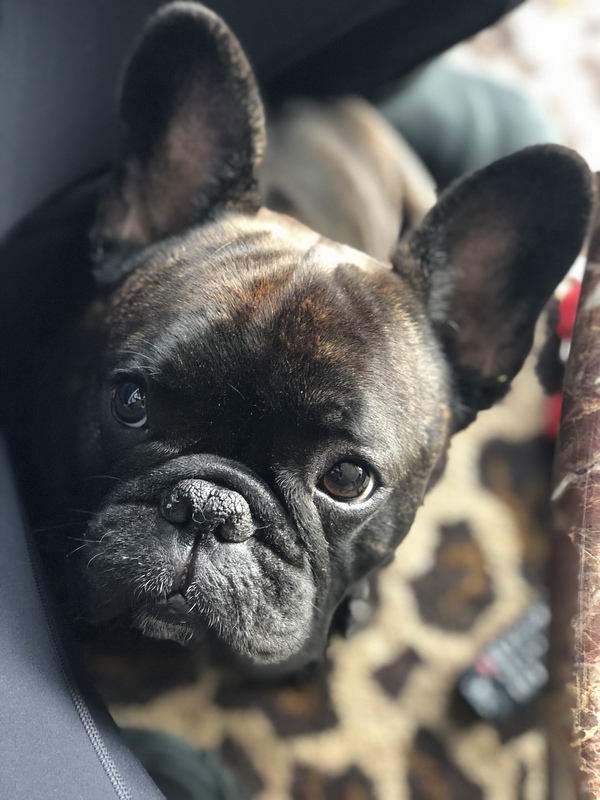 After lunch with my boyfriend, I head home to walk our Frenchie. After a walk in the cold Chicago winter, we come back and he lays on my lap while I read or listen to an audiobook. When I read, I prefer non-fiction. Right now I am reading How Not To Die and Justice Denied. In the evening, I teach the 4:30 and 5:30 Total Body Strength classes at our Roscoe Village location. These classes are similar to our regular Total Body class, except we are solely focusing on strength training. You can expect to see lower reps, higher weights and slower tempo with each movement. There is no running, rowing, burpees or any other cardio-centric movements. I really enjoy teaching our strength classes because people impress and surprise themselves with how strong they are. After teaching, I have one more Personal Training client, then at 7, a potential new personal trainer is doing a demo PT session with me. To ensure that every trainer we hire is high quality and is held to the same high standard, we ask them to do several demo sessions, to really see how they work one-on-one with clients, how they correct poor form, how they pair exercises and program their sessions. I love learning and each trainer has different specialties that they bring to the table so while I get a great workout, I also try to learn something new from each person. When I get home I eat dinner right away. Tonight I called my boyfriend on the way home to ask him to re-heat veggie chili that I made on Monday so that it’s ready when I get there. I pour it over a bed of kale and quinoa to get in more veggies and grains. I love playing games and prefer that over watching TV any day, so tonight we’re playing UpWords while I eat dinner. I try to get into bed by 9:30 each night so I’m rested and ready for another early morning the next day.